Moon photography is something almost everyone has tried at some point. It's big, it's lit beautifully, and it's simply majestic, but most photos do not capture that magic. Quite often, the result is a blurry image or a bright speck on the film and it can be very disappointing. Capturing great moon pictures is simple once you know a few tricks to the subject. 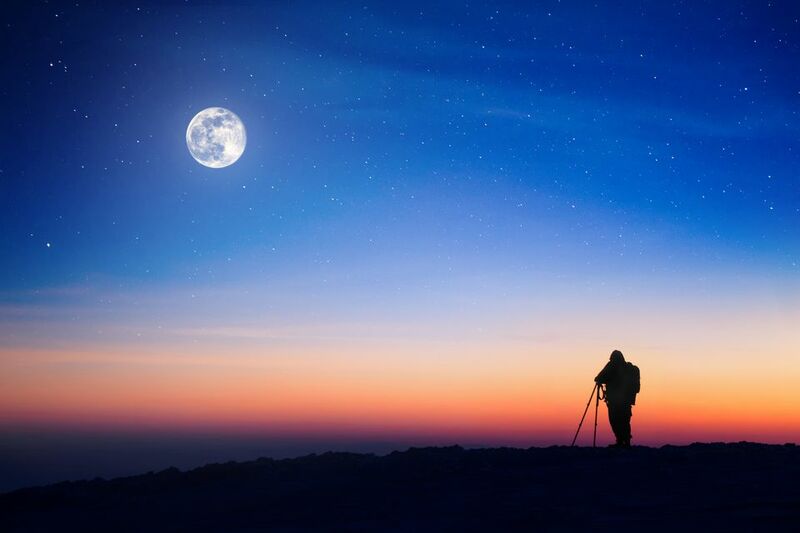 You simply need the right equipment and the ability to look at the moon in a different way. A camera that lets you control shutter speed and aperture. Zoom capability to about 300mm (this is 10x zoom on some point and shoot type cameras). A tripod is highly recommended, but with the right shutter speed, you can get away without one. The main problem most people have with moon photography is that they think of the moon as a “night subject.” Because of this, they turn their cameras to the night preset or automatically start at a slow shutter speed to increase light. The moon, however, is so bright that the opposite is true. It is basically like taking a photo of an illuminated light bulb in a dark room. If you use the exposure reading your camera gives you with its built-in light meter, the image will be overexposed and you are left with a bright dot without any detail. To get a clear, detailed photograph of the moon you will need to underexpose the image by 1/2 stop to 1 stop. It is fine to use a small F-stop (large aperture) for this application as the distance between us and the moon increases the effective depth of field considerably. If your camera allows you to choose autofocus points, focus on the moon itself. As long as it is set to also meter from this selected AF point, the exposure should automatically compensate for the luminance of the moon. You may need to make further adjustments, but it's a good place to begin. The moon moves. Because the moon rotates around the Earth as the Earth itself is moving, slow shutter speeds will cause the moon to blur in your photos. To combat this, use the highest possible shutter speed with a relatively small F-Stop to get a good exposure (in this case, a slightly underexposed) image. With the desired slight underexposure, you should be able to get a fast enough shutter speed to hand-hold your camera. Remember that with a 300mm zoom lens, you will need a shutter speed of at least 1/350 for a clear image. Contrary to what you may expect, nighttime is not always the best time to shoot the moon. Instead, shoot the moon just after sunset or right before sunrise. Look for a time of day when the sky still has just a hint of blue to it and you can see where you are walking without a flashlight. Because of the timing of the moon cycle, there will be several days each month when the moon rises or sets before the dark of night sets in. Also, because of atmospheric conditions, the moon appears largest just after rising. The first 30 minutes after moonrise is the best time to get close-up images of the moon as it appears much larger in the sky than later in its arc. This is why you see so many gorgeous photos of the moon over an illuminated cityscape rather than high in the sky. Those photographers knew that the larger moon comes early in the evening (also, the foreground subject adds depth).